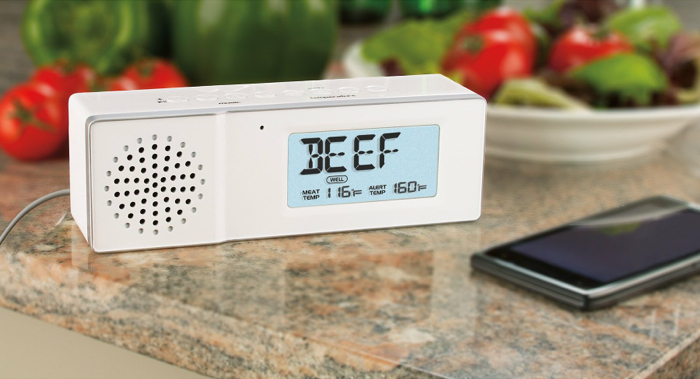 A cool little kitchen appliance that monitors your meat in the oven and takes and makes phone calls – all while you listen to music from your bluetooth phone or tablet. 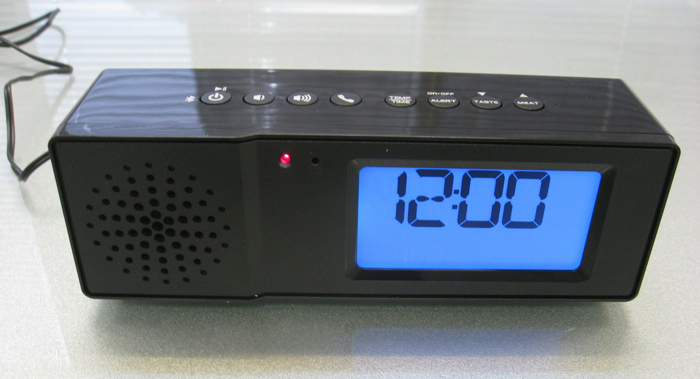 Bluetooth kitchen speaker, hands free phone, roasting thermometer and clock – Chef Tunes by Maverick does all that. Check out our video review at the bottom of this post. Their newest device from Appliance Reviewer is just made for the indoor cook. Allowing you to listen to music from your iPhone or iPod or other bluetooth enabled device, while monitoring meat roasting in the oven with a single probe – this device also makes and takes phone calls. Very handy. The small countertop box is powered by both AC and rechargeable batteries. Conceivably you could use this device out at the grill too. You now have a fairly powerful and loud speaker to listen to your tunes via bluetooth, while you monitor your meat in the oven. The audio in our video does not give the sound justice… it’s remarkably good! The combination of timer and temp monitor will give you peace of mind. And when that pesky phone call comes in, you can take it by simply touching a button and go hands-free while you cook. SVM Products also sell the excellent Maverick ET-732 Remote Barbecue Thermometer. Our review of the Maverick ET-732 is here. Well isn’t that awesome? The only downside to it is that I would actually have to enable Bluetooth, which I keep locked down. It’s been so long since I’ve used Bluetooth that I don’t remember but I’m sure I can figure it out.